Leukodystrophies are a group of disorders that cause deterioration of the white matter, or myelin, in the brain. The term Leukodystrophy comes from the prefix leuko, meaning white, and the word dystrophy, meaning imperfect growth. Therefore, Leukodystrophies are characterized by imperfect growth of the white matter in the brain. There are approximately 50 identified Leukodystrophies, which are genetic, progressive disorders that affect the myelin in the brain (also known as white matter). Alone, each Leukodystrophy may be considered rare, but as a group, these diseases affect approximately 1 in 7,000 individuals. While the specific cause of many Leukodystrophies have been identified based on the genetic mutation causing the disease, nearly half of all individuals diagnosed with Leukodystrophy have yet to receive a known source of the genetic defect. This is where the term “Unspecified Leukodystrophy” is derived, which is also sometimes referred to as Undiagnosed Leukodystrophy. There have been significant improvements in identifying the basis of the genetic mutations throughout the last ten years. As research advances, particularly with whole exome sequencing, scientists will continue to discover and classify new variations in this family of diseases. This is so important so that effective treatments can be developed, and affected individuals can have the best quality of care possible. Whole exome sequencing is a means of interpreting DNA in an effort to identify the mutation responsible for causing disease, and in this case a Leukodystrophy, in the affected individual. The exome is a part of the genome, or the complete set of genetic material present in a cell. The exome makes up about 1% of the genetic makeup of the cell, but is the part that most likely contains the decodable mutations that results in the present, visible symptoms of the affected individual. How does Unspecified Leukodystrophy affect the individual? How do you get an Unspecified Leukodystrophy? There are many ways in which individuals can develop Leukodystrophy, however, without an identified genetic mutation, it is extremely difficult to pinpoint the origin of the disease. Most Leukodystrophies are inherited disorders, meaning it is passed down from the parents who are usually unknowingly carriers of the mutation. 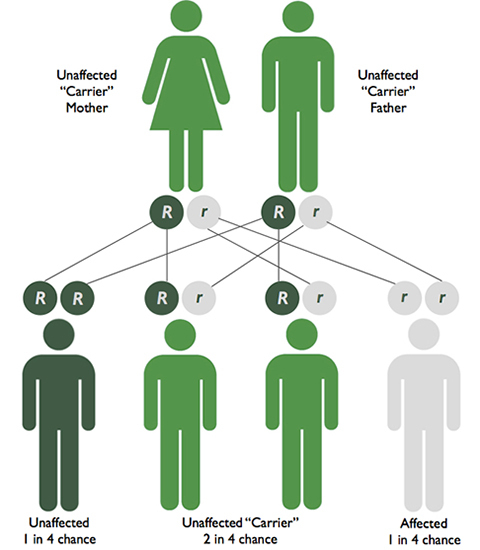 One way in which Leukodystrophies can be inherited it through an autosomal recessive manner. This means that if both parents are carriers of the disease, each child they conceive will have a 1 in 4 chance of developing the Leukodystrophy. 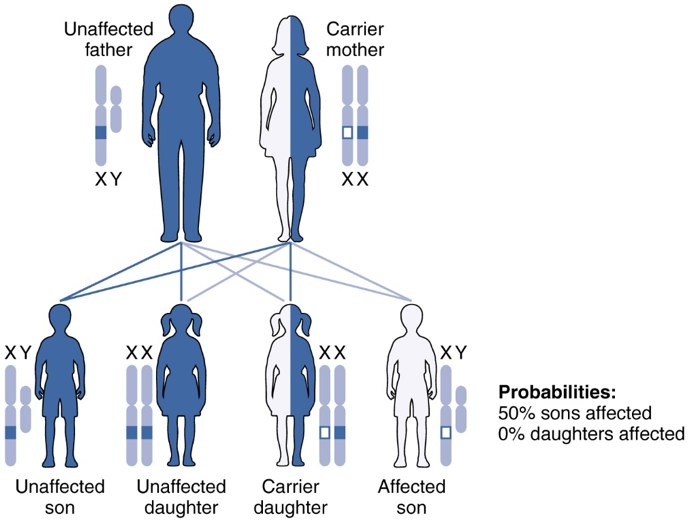 When both parents are carriers of a specific mutated gene, such as those for Krabbe Disease, their children have a 25% chance of being affected by the disease, a 25% chance of neither being a carrier nor affected, and a 50% chance of being an unaffected carrier, just like their parents. See illustration below. X-Linked inheritance is another way some Leukodystrophies are inherited from parents. This means the mutated gene that causes the disorder is located on the X chromosome. At birth females receive two X chromosomes while males receive one X and one Y chromosome. If females inherit the altered gene on one of the X chromosomes, the other X chromosome is usually able to compensate for the defect. However, if males inherit the defected gene, there is not an extra X chromosome to counteract the disease-causing, altered gene. Another characteristic of X-linked inheritance is that fathers cannot pass X-linked traits to their sons, however, a female carrier with one altered copy of the gene can pass it on and generally will not experience signs and symptoms. See illustration below. In a very small number of Leukodystrophy cases, the disease is not always hereditary. Rarely the disease can result from a spontaneous mutation, meaning it was not inherited from the parents. Could other children in the family also have Unspecified Leukodystrophy? Since the vast majority of Leukodystrophies are hereditary, though some cases are caused by a spontaneous genetic mutation, it is important to speak with a geneticist or an expert in Leukodystrophies to discuss the likelihood of the disease being passed down genetically to other members of your family. It would also be of timely importance to have other children in the family tested, particularly since the root cause of the disease is unknown. How is Unspecified Leukodystrophy diagnosed? While the degeneration of myelin can be seen in an MRI and used to diagnose Leukodystrophy, further testing will need to take place to determine the exact source. Genetic testing is needed to confirm most Leukodystrophy diagnoses. Since the responsible source of nearly half of all Leukodystrophy diagnoses cannot initially be determined, whole exome sequencing can be done in an attempt to provide these answers, following testing that has been done to rule out more common Leukodystrophies by a Leukodystrophy expert. This approach is not always effective, but has significantly reduced the number of unspecified cases throughout the last several years. What research is being done to find better treatments & a cure for Unspecified Leukodystrophy? Hunter’s Hope is committed to funding research for better treatments and a cure for Leukodystrophies. To learn more about the groundbreaking research currently underway, visit the Research section of our website. The Leukodystrophy Center for Excellence at The Children’s Hospital of Philadelphia (CHOP) is also committed to research and is currently undergoing a clinical trial specifically working toward finding the cause of Unspecified Leukodystrophies. To find out more about this opportunity please click here. If you are interested in being a part of this study, you may start the process by filling out the referral survey for CHOP. Also, Kennedy Krieger Institute, a Leukodystrophy Care Network Center, has had an active program for more than 20 years to identify cases of Unspecified Leukodystrophy utilizing whole exome sequencing. To learn more, visit their website here.